Interior designer Gabrielle Blair has a hectic life. With six children  yes, six  you'd think that her design flair wouldn't extend much beyond diapers. 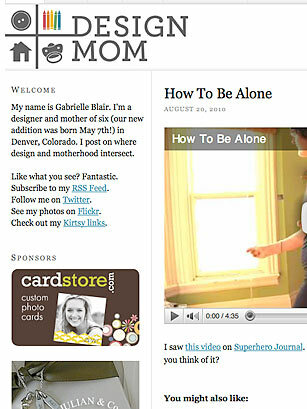 Instead, Blair's posts on her popular site, Design Mom, about where design meets motherhood, show that somehow you can have it all: the big family, a keen eye and creative flair. Check out her posts about fingerprint cut-paper art, foyer renovations and  we almost forgot  the birth of her daughter in May. Just don't hate her (too much) for being perfect.